The British Gurkha Welfare Society (BGWS) is one of the largest welfare organisation supporting Gurkhas in the UK and Nepal. Founded in 2004, the BGWS has been one of the leading campaigners on issues of Gurkha welfare including settlement and pension rights. The Gurkhas were brought fully into the public consciousness in 2009, when a Joanna Lumley-led campaign overturned the policy of the then-Government and secured settlement rights for Gurkhas who had retired before 1997 – opening the door for these veterans to relocate to the UK. The BGWS continued to campaign for Gurkha welfare, particularly on the issue of pensions. 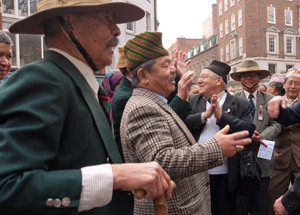 While Gurkhas who retired before 1997 were granted the right to settle in the UK, they do not receive a pension equal to those of their former British colleagues – leaving many in Nepal in desperate financial need and forced to relocate to the UK, often leaving family and friends behind, in order to achieve a better quality of life. However, many as these Gurkhas found themselves just above the poverty line and reliant on State support. In October 2009 the BGWS won the right to a judicial review of the Ministry of Defence’s pensions policy. The High Court returned a verdict against the Gurkhas in January 2010, with the decision subsequently upheld in October 2010 by the Court of Appeal. Whitehouse continued to ensure that the BGWS voice was heard at every level of Parliament, and maintained an energetic programme of MP briefing meetings, stakeholder engagement and contributions of evidence to Select Committee proceedings. We also assisted the BGWS in forming the Gurkha Welfare All-Party Group, for which the BGWS provided secretariat support. Whitehouse also maintained an aggressive public relations campaign to support the BGWS efforts – particularly in relation to its legal case. Capitalising on the widespread public support for the Gurkhas, Whitehouse arranged numerous interviews for the BGWS’s spokesmen with UK national newspapers, television and radio – along with key international news outlets. The BGWS wasfirmly recognised as the leading Gurkha voice for pensions equality, and made a comprehensive case to government, helping to secure funding to support local services in the areas favoured by veterans moving to the UK. Whitehouse ensured that Gurkhas have never been far from the headlines – securing more than 600 pieces of UK and international coverage across news outlets including the BBC, Sky News, The Times, The Independent, Daily Telegraph and the Wall Street Journal.